Soil Physical Chemistry, Second Edition takes up where the last edition left off. With comprehensive and contemporary discussions on equilibrium and kinetic aspects of major soil chemical process and reactions this excellent text/reference presents new chapters on precipitation/dissolution, modeling of adsorption reactions at the mineral/water interface, and the chemistry of humic substances. An emphasis is placed on understanding soil chemical reactions from a microscopic point of view and rigorous theoretical developments such as the use of modern in situ surface chemical probes such as x-ray adsorption fine structure (XAFS), Fournier transform infrared (FTIR) spectroscopies, and scanning probe microscopies (SPM) are discussed. 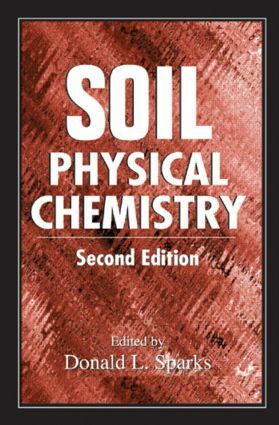 "In this very complete book of soil physical chemistry employing concepts of chemical physics to soil technology, the chemical reactions of this chemistry are explained in detail, utilizing kinetics, electrochemistry, thermodynamics, and precipitation reactions."